Rail officials warned that repairs were likely to take “quite a long time”. 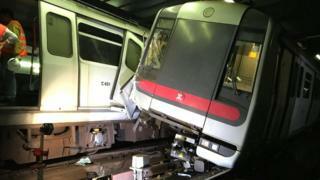 MTR said the collision near Hong Kong’s main business districts involved a “modernised train” that had since been returned to its depot for inspection. An investigation into the incident is now under way. Hong Kong’s subway network is used by up to six million people during weekdays, Reuters news agency reports.